Migrating to cloud-based apps like Office 365, Salesforce.com, Workday? Smart. Waiting for your users to report outages and performance problems? Not so smart. SaaS applications give you the benefits of unlimited scalability & agility without the costs and burden of managing your own infrastructure. But just because you no longer own the servers doesn’t mean you’re not on the hook to ensure your users have continuous access to the apps the rely on. You can’t simply wait for users to complain or an outage to occur and the tools you’ve been using to monitor apps in you datacenter can’t see far enough into the cloud to be effective. We’re all familiar with the complaints about “Email is down” or “the Internet is slow”. You need insights into how your new cloud services are performing. In real-time. To succeed in the cloud you need a monitoring solution built for the needs of the cloud. Exoprise gives you unmatched insight into the health and performance of your cloud-based applications, monitored from your users’ points of access. 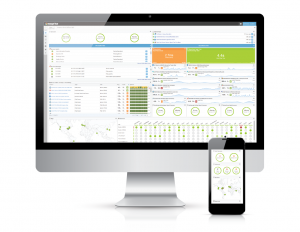 Combining continuous application monitoring, real-time alerts, end-to-end transaction diagnostics, and the ability to compare local measurements with data crowd sourced globally across other application subscribers, CloudReady enables you to identify and resolve issues before they affect your users. CloudReady is an easy-to-deploy hybrid SaaS solution, that can be up and running in just 5 minutes. Lightweight software agents (sensors) monitor the cloud from any Windows machine in your network and can be managed from any web browser. Choose from a variety of pre-configured sensors for the most popular apps, general web and network monitoring sensors, as well as sensors for hybrid cloud infrastructure (e.g. ADFS, AD, and local Exchange servers) so you can get a complete picture of your entire SaaS service delivery chain. Business Apps like Salesforce.com, Workday, etc.